Windows and weatherization have been in the news a lot lately with President Obama pushing a for Americans to make improvements to the energy efficiency of their homes. He's spoken a lot about replacing windows, and not so much about repairing existing single-pane windows or making small changes that will improve their efficiency. This is at odds with his other "green" initiatives, and seems to be the result of much lobbying from the replacement window industry. Their seals will fail after about 15 years - sometimes sooner - though it's usually after the warranty has expired. Then you'll need to replace your replacement window! New windows require a lot of energy to manufacture, uses up natural resources (wood), and introduces toxic chemicals into the environment during the manufacture of vinyl, and again when the failed window is taken to the dump. They also have to be transported to your site - often from across the country requiring use of fossil fuels and adding to air pollution. Wood used in new windows is "new-growth" wood. 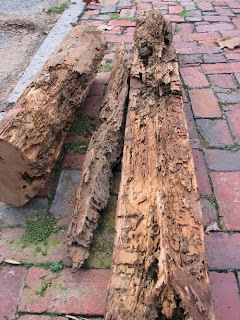 Because it grows so quickly, it's softer and less resistant to deterioration and insect damage than old-growth wood that was used to manufacture older and historic windows. The money you spend on buying replacement windows leaves your local economy (unless you live in a town where a window manufacturing plant is located and buy them from a locally-owned retailer). From a jobs creation standpoint, fixing up your old windows is far better than replacing them. It's a more labor intensive process than installing replacements, and the jobs are entirely created in your local economy. Caulk, glazing compound, and glass is pretty cheap - so are replacement sash cords - paying someone to do the work (if you don't just do it yourself) is good for your local economy, and generally good for your own wallet! From a historic preservation perspective, it's pretty simple...They're not your original windows - they are a substitute. And they look like a substitute! They don't match the look of your house. Windows are very important in defining the character of buildings - change the windows and you'll dramatically change the appearance of your house. In general, a much "greener" and better alternative is to fix up your original single-pane windows. Regardless of what the replacement window manufacturers tell you, single pane windows with a storm (interior or exterior) and some judicious use of caulk can be as efficient as a new replacement window. In some cases they provide better efficiency because the insulating factor of a window comes from the air (or other gas) between two pieces of glass. Since the space between a single pane window and its storm is wider than the space between two pane of glass in a replacement window, its insulating factor is higher. Also, if you repair your old windows so that both the top and bottom sashes are working, then in warmer months when you raise the lower sash to let cool air in, you can also lower the top sash to let warm air out. This natural ventilation system will keep your house cooler and reduce those giant electricity bills for air conditioning! At our historic sites, we'll be tackling some window projects at the Amstel House after the holidays. The primary window project is the installation of interior storm windows throughout the building. These interior storms will help us with improving the energy efficiency of our historic single pane windows and limiting UV light to the interior (which damages objects over time). 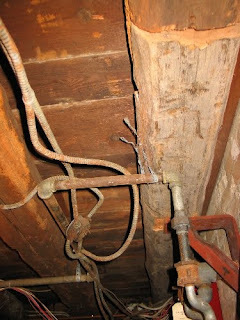 We'll also be doing our share of caulking as well as adding insulation to attics and cellars. We're looking into scheduling a workshop to discuss storm windows and maybe glazing repairs sometime in January or February (stay tuned for more info about that). 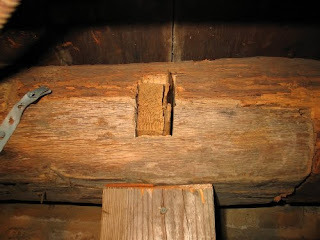 Our carpenters tackled the challenging replacement of a hand hewn joist in the Dutch House cellar last week. 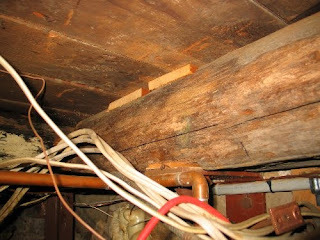 The original log joist was severly deteriorated - primarily due to old insect damage. the joist was supposed to be supporting the first floor along the west side of the building but really wasn't doing much of anything. The tenon of the joust was gone and the end of the timber was just floating. 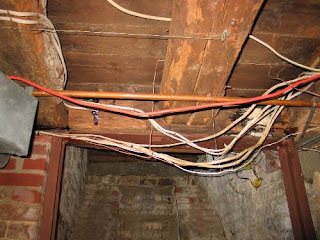 The whole joist was not damaged - so we only need to replace about 12 feet of it. The section of the old log that had to be removed was cut into pieces with a chain saw. Here's a pic of the old log laying out on the curb...I think you'll see why we had to replace it! The replacement timber is a hand-hewn oak timber that was salvaged from another historic structure. 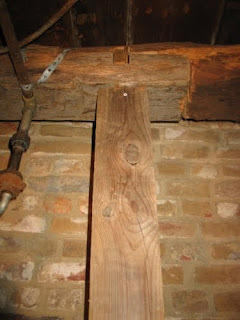 It was cut to rough size before carrying it into the cellar, and final cuts were made once the old timber was removed. And that pretty much wraps up the structural work at the Dutch House, as well as the projects there in this phase of our work. When we finish the Amstel projects we'll see where we stand with funding and see if we can tackle some additional projects there.